Dugald McConnell and Brian Todd, “Is bin Laden’s son being groomed for key al Qaeda role?,” CNN, May 13, 2016, http://www.cnn.com/2016/05/13/world/bin-laden-son-al-qaeda/. Bruce Riedel, “The son speaks: Al-Qaida’s new face,” Brookings Institution, August 19, 2015, https://www.brookings.edu/blog/markaz/2015/08/19/the-son-speaks-al-qaidas-new-face/. In the same recording, Hamza pledged allegiance to Zawahiri and deceased Taliban leader Mullah Mohammad Omar, and urged lone wolf terrorists to carry out attacks against American and Jewish targets in Washington D.C., London, Paris, and Tel Aviv.Bruce Riedel, “The son speaks: Al-Qaida’s new face,” Brookings Institution, August 19, 2015, https://www.brookings.edu/blog/markaz/2015/08/19/the-son-speaks-al-qaidas-new-face/. He also praised the 2009 Fort Hood shooting carried out by Nidal Hassan, as well as the 2013 Boston Marathon bombings perpetrated by brothers Tamerlan and Dzhokhar Tsarnaev.Rohan Smith, “Hamza bin Laden’s rise through the ranks of the world’s most infamous terror family,” news.au, July 12, 2016, http://www.news.com.au/world/middle-east/hamza-bin-ladens-rise-through-the-ranks-of-the-worlds-most-infamous-terror-family/news-story/5d0487c485617a9b4d07cae9bb1a1691. Rohan Smith, “Hamza bin Laden’s rise through the ranks of the world’s most infamous terror family,” news.au, July 12, 2016, http://www.news.com.au/world/middle-east/hamza-bin-ladens-rise-through-the-ranks-of-the-worlds-most-infamous-terror-family/news-story/5d0487c485617a9b4d07cae9bb1a1691. Reports allege that following the September 11, 2001, attacks, Osama bin Laden moved key al-Qaeda members and members of his family—including Hamza and Hamza’s mother—to Iran. There, Taliban operatives were tasked with indoctrinating Hamza with their “ideology, vision, and approach,” according to Saudi-owned news outlet Al-Arabiya. The timeline of Hamza’s alleged years in Iran is unclear, though letters between Osama bin Laden and Hamza place Hamza in Iran during the 2011 Abbottabad raid that resulted in Osama’s death.Huda al-Saleh, “From Iran to al-Qaeda: How Hamza bin Laden’s future was secured,” Al-Arabiya, October 4, 2016, https://english.alarabiya.net/en/perspective/analysis/2016/10/04/From-Iran-to-al-Qaeda-How-Osama-bin-Laden-secured-son-s-future.html. If Hamza indeed moved to Iran following the September 11 attacks, then footage of Hamza featured in al-Qaeda videos between 2001 and 2008 was most likely filmed before the attacks.“Message from Bin Laden’s son exposes ‘Iran’s revival of al-Qaeda,” Al-Arabiya, July 26, 2016, https://english.alarabiya.net/en/perspective/2016/07/26/Message-from-Bin-Laden-s-son-exposes-Iran-s-attempt-to-revive-al-Qaeda-.html. Though Hamza has long been well-known within al-Qaeda and the larger jihadist community, he now provides a “new face” for the terror group, according to counterterrorism expert Bruce Riedel. According to Riedel, Hamza’s face is “one that directly connects to the group’s founder. He is an articulate and dangerous enemy.”Bruce Riedel, “The son speaks: Al-Qaida’s new face,” Brookings Institution, August 19, 2015, https://www.brookings.edu/blog/markaz/2015/08/19/the-son-speaks-al-qaidas-new-face/. Ali Soufan, “Hamza Bin Laden, Osama’s Son, Is Helping Al-Qaeda Stage A Deadly Comeback,” Newsweek, June 19, 2017, http://www.newsweek.com/2017/06/30/bin-laden-osama-son-helping-al-qaeda-stage-deadly-comeback-627207.html. Abu MoazHuda al-Saleh, “From Iran to al-Qaeda: How Hamza bin Laden’s future was secured,” Al-Jazeera, October 4, 2016, https://english.alarabiya.net/en/perspective/analysis/2016/10/04/From-Iran-to-al-Qaeda-How-Osama-bin-Laden-secured-son-s-future.html. Abu-Usamah“Letter from Hamzah to father dtd July 2009,” Director of National Intelligence, accessed 10 June 2016, https://www.dni.gov/files/documents/ubl/english/Letter%20from%20Hamzah%20to%20father%20dtd%20July%202009.pdf. Crown Prince of TerrorMuna Khan, “The ‘Crown Prince of Terror’ who could be King,” Al-Arabiya, May 26, 2011, http://english.alarabiya.net/articles/2011/05/26/150646.html. Hamzah bin Laden“Letter from Hamzah to father dtd July 2009,” DNI: Bin Laden’s Bookshelf, accessed June 10, 2016, https://www.dni.gov/files/documents/ubl/english/Letter%20from%20Hamzah%20to%20father%20dtd%20July%202009.pdf. Hamzah bin Usamah bin Mohammed bin Awad bin Laden“Osama bin Laden Fast Facts,” CNN, May 20, 2015, http://www.cnn.com/2013/08/30/world/osama-bin-laden-fast-facts/. The U.S. Department of State designated “Hamza bin Laden” as a Specially Designated Global Terrorist (SDGT) under Executive order 13224 on January 5, 2017.“State Department Terrorist Designation of Hamza bin Laden,” U.S. Department of State, January 5, 2017, https://www.state.gov/r/pa/prs/ps/2017/01/266522.htm. Renews his call for Saudi Arabia’s monarchy to be overthrown: “So look—may Allah have mercy on you—how Ibn Saud made himself an obedient representative to the British occupant power, and an agent to it, where he surrendered everything that he can surrender in return for receiving money and weapons from it to fight the allies of the Ottomans. So would it be right after all this for him to become an idol for the Islamic Ummah? […] Do you know what the Uqair agreements are? They are agreements to rally behind the disbelievers, and to denounce the believers, and to hand over the lands to the Crusaders so that they would occupy it officially yet indirectly. […] Through this, Ibn Saud terminated his loyalty to the Islamic Ummah outside his borders, and made himself a delegate for the Crusaders and a representative for them.”Cristina Maza, “Hamza Bin Laden, Osama’s son, denounces Saudi Arabia, calls for overthrow of monarchy in new Al-Qaeda video”, Newsweek, January 19, 2018, www.newsweek.com/hamza-bin-laden-osama-saudi-785121. “Prepare diligently to inflict crippling losses on those who have disbelieved. 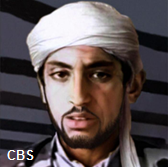 Follow in the footsteps of martyrdom-seekers before you.”Joby Warrick and Souad Mekhennet, “Bin Laden’s Son Steps into Father’s Shoes as al-Qaeda Attempts a Comeback,” Washington Post, May 27, 2017, https://www.washingtonpost.com/world/national-security/bin-ladens-son-steps-into-fathers-shoes-as-al-qaeda-attempts-a-comeback/2017/05/27/0c89ffc0-4198-11e7-9869-bac8b446820a_story.html?utm_term=.c4b1403a2b92. “LISTEN: Osama bin Laden’s Son Urges Jihadists to Go to Syria,” Heavy, May 9, 2016, http://heavy.com/news/2016/05/al-qaeda-audio-message-usama-bin-laden-hamza-jerusalem-is-a-bride-and-our-blood-is-her-dowery-mp3-youtube/. “I figured that the Zionist-Crusader alliance led by America today is like a bird: America is its head, NATO is one wing and the Jewish state in the occupied Palestine is the other wing, and the legs are the oppressive dictators sitting on the chests of the peoples of the Muslim Ummah … By concentrating on the head, with permission from Allah, it guarantees that all will vanish. This is the general plan of the Mujahideen.”“Words of Wisdom,” (14-15), Inspire, September 2015, Issue 14, https://azelin.files.wordpress.com/2015/09/inspire-magazine-14.pdf. “[Jihadists must] take the battlefield from Kabul, Baghdad and Gaza to Washington, London, Paris and Tel Aviv.”Ali Soufan, “Hamza Bin Laden, Osama’s Son, Is Helping Al-Qaeda Stage A Deadly Comeback,” Newsweek, June 19, 2017, http://www.newsweek.com/2017/06/30/bin-laden-osama-son-helping-al-qaeda-stage-deadly-comeback-627207.html.